1xRUN is proud to announce the event lineup for Murals In The Market 2017 as the critically acclaimed mural festival returns to Detroit’s Historic Eastern Market for the third consecutive year. 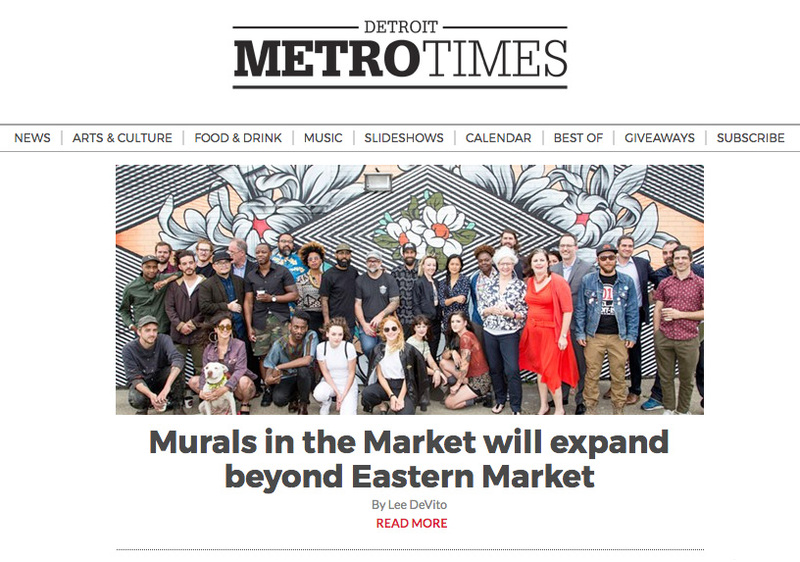 In addition to being surrounded by live painting from over 50 local and international muralists, Detroiters and art fans from around the world will have the opportunity to participate in over a dozen cultural events beginning September 6th with six new Detroit Community Market Murals at various community markets throughout the city. On top of daily mural painting throughout Eastern Market, Murals In The Market will host immersive art exhibitions that will transform the 1xRUN Warehouse at 1550 Winder with lighting and set design from Detroit’s own Haute To Death, and a solo exhibition from Oakland based artist Eddie Colla. 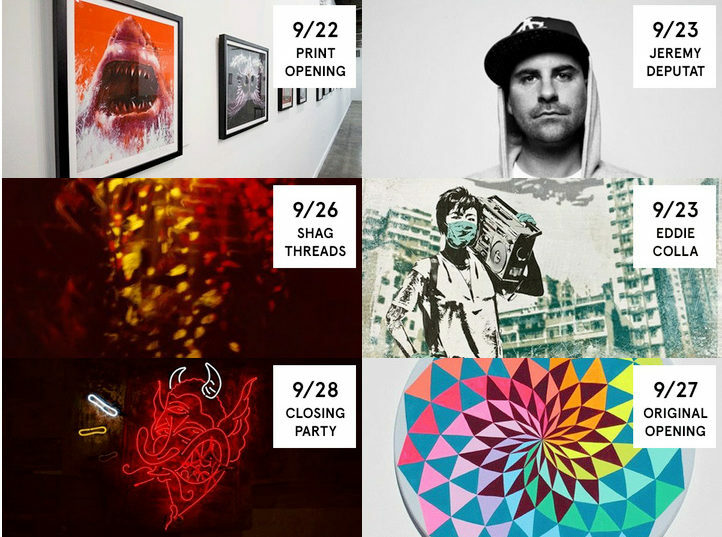 In addition, 1xRUN will present several exhibitions featuring original artwork, wearable art and print editions showcasing a variety of new work from participating festival artists available in several mediums. 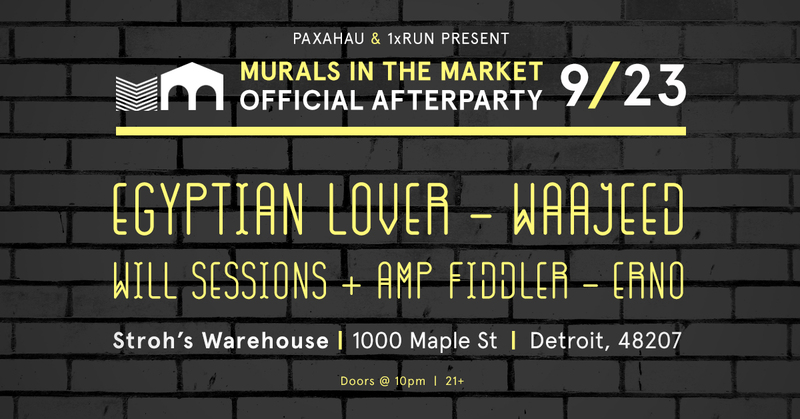 This year things kick into high gear on September 23rd as Murals In the Market teams up once again with Paxahau for the Murals In The Market Official After Party featuring Egyptian Lover, Waajeed, Will Sessions with Amp Fiddler and Erno at the Stroh’s Warehouse in Detroit’s Eastern Market. (Buy Tickets Right HERE!) Throughout the festival music from Lady Monnix, Drummer B and Haute To Death will keep the party going with the signature sounds of Detroit each day. Expanding the festival’s footprint city-wide, Murals In The Market starts on September 6th with five new Detroit Community Market Murals at local farmer’s markets throughout the city, including Northwest Detroit Farmers Market, Sowing Seeds Growing Futures, Peaches & Greens Market and Truck, Drew Transition Center Farm Stand and Meldrum Fresh Market. Participating local artists that will work with the community markets are Ellen Rutt, Tylonn J. Sawyer, Julian Spradlin, Zac Meers and Paul Johnson. Working with local partners at the Detroit Riverfront Conservancy and the Detroit Jazz Festival, the festival has also curated two new murals from 2017 Murals In The Market artist W.C. Bevan, which was recently unveiled at the 6th Annual Soiree On The Greenway, and 2016 alumni artist Shades at Bert’s Warehouse in Eastern Market for the 2017 Detroit Jazz Festival. With dozens of murals being added for 2017, and hundreds already created throughout Eastern Market, this year fans can get a helping hand (and some behind the scenes stories!) on Official Walking Tours with the Murals In The Market Team throughout the week. Get the lowdown with Festival Producer Roula David, 1xRUN Co-Founder & Festival Publicist Jesse Cory and Co-Founder of 1xRUN & Festival Art Director Dan Armand, as they will guide festival goers through the market while painting kicks off and give some of the history behind these amazing works. In addition to walking tours, Slow Roll will also return for the third consecutive year, giving fans a chance to bike the city beginning and ending in Eastern Market. View The Full 2017 Murals In The Market Event Lineup Here! A pillar of Detroit’s east side, Eastern Market will be bustling throughout the 10-day festival with their Tuesday, Saturday and Sunday Markets. Showcasing not only food from Detroit’s best local farms, these specialty markets feature locally made art and jewelry, specialty products, live music, children’s workshops, prepared-food vendors and much more. Building upon the resounding success of the festival’s first two years, Murals In The Market will continue to expand Eastern Market’s walkable footprint, giving visitors locally and internationally a look into businesses and areas often unseen and underutilized, with more than 100 public murals strategically placed throughout the Market District. Local and national foundations and sponsors will help make 2017 the best yet, as presenting supporters, the William Davidson Foundation along with the Knight Foundation and 1xRUN will be joined by Eastern Market Corporation, Lot 40, Behr, Quicken Loans, WeWork, Montana Cans, Olukai, Detroit Jazz Festival, Brooklyn Outdoor, Aptemal, Paxahau, Recycle Here!, MoGo Detroit, Thinkspace Gallery and Inner State Gallery. More information can be found at muralsinthemarket.com, on Instagram @MuralsInTheMarket and on Facebook @MuralsInTheMarket.